If I told you in October that Nick Bonino would be a playoff hero and clutch guy down the stretch, would you believe me? Doubtful. He had a couple of decent seasons the past two years in Anaheim and Vancouver, but you rarely expect heroics from a career third-liner. What if I told you that in December? Nope. February? Ha. The guy's hurt. April? Well...maybe. That line has been playing really well. For most of the season, Bonino has been known for his strong penalty killing and high face-off percentage, not his offensive prowess. When it was announced that Bonino would center Hagelin and Kessel in the game against the Rangers on March 13, the first game after Malkin was injured, a lot of fans were wondering what the coaching staff was thinking. Especially when Matt Cullen had been filling in admirably when Malkin had been previously injured. Nick Bonino, second line center. Yikes. @JoshYohe_PGH well, there goes any hope of playoff run. Nick Bonino isn't a 2nd line center. Second only to Kessel in missing open nets. As is usually the case, Sully saw something in Bonino that the rest of us missed (I guess that's why he's the head coach). All season long Sullivan's favorite word to describe Bonino is "cerebral." That's why he put Bonino with Hagelin and Kessel. It took a few games for the HBK line to find their rhythm, but they've been a consistent offensive machine since March 17 against Carolina. Since that game Bonino had 5G, 9A, and 16 points. That's more than half of what he had in all three categories prior to that game (4G, 9A, 13P). On March 26 in a 7-2 win at Detroit, that line produced 12 points with Bonino and Kessel each tallying 5. A lot of his success was attributed to his new linemates, and that's true in many ways. You're going to play your best when you're surrounded by the best. Kessel and Hagelin were having offensive success prior to skating with Bonino. But Bonino doesn't just look good and reap the benefits of his speedy linemates, Bonino is actually really good. He makes smart decisions, he moves the puck well, he reads the defense better than most. He's not just benefiting from Kessel and Hagelin, they're benefiting from him. I'll say the same thing about Bonino that I said about Kessel - he just needed some time to find his rhythm and role with this team. You can see it in their faces. They're finally enjoying themselves. Bonino is 28, but this is only his third full season in the NHL. He still has some room to grow. He's playing on his third team in three years with a coaching change mid-season. Not everyone is going to be able to come in and make an immediate impact like Daley and Hagelin. As much as we expect that from professional players, it doesn't work that way. When Malkin returned after injury, fans changed their tune and were begging the coaching staff to not break up the HBK line. The line stayed intact and the Game 6, series-clinching win over the Capitals on Monday night was dominated by them. Kessel scored twice, Hagelin scored once and Bonino scored the game-winning OT because he put himself in position to make a play while Kessel and Hags cycled the puck. Nick Bonino is a special player. And not because his linemates make him look that way. I think we've seen glimpses of it all season. I've been waiting for him to break out since the December 21 game against Columbus. He centered Kessel and Kunitz for that one game and tallied two points that night. I was surprised they didn't use that line for any other games based on how strong they played. It may not look like he's anyone to brag about by looking at his regular season stats, but he's a key component to this Pens' playoff machine. 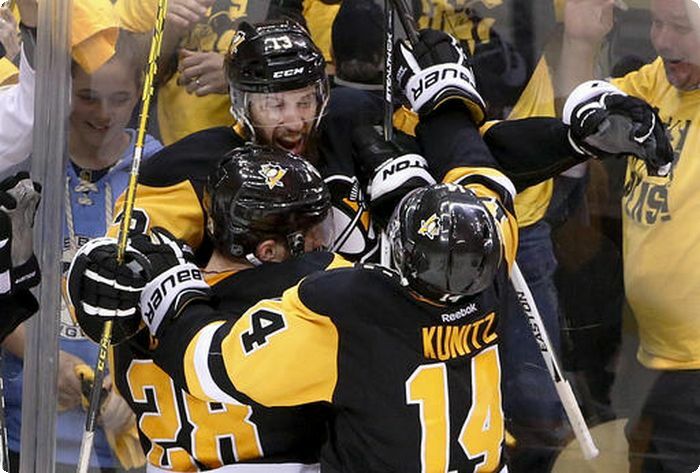 Sullivan has repeatedly praised him and stated that Bonino is much better than he appears on the score sheet. Another good move by Jim Rutherford. I'd take him over Brandon Sutter. Plus, he's got a better playoff beard than Sutter.